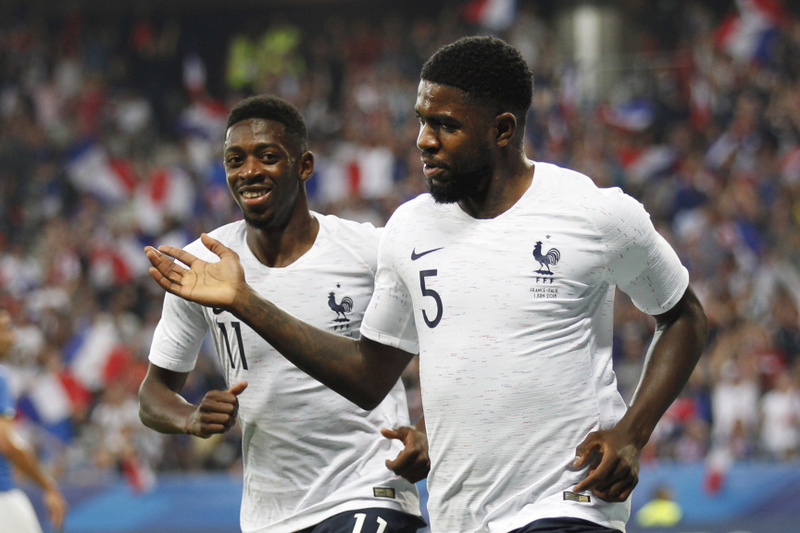 NICE, France (AP) — France showed glimpses of its attacking potential with a 3-1 home win against Italy in a World Cup warmup match on Friday. Antoine Griezmann and Ousmane Dembele scored, while Kylian Mbappe was involved in center half Samuel Umtiti's opening goal. Center half Leonardo Bonucci briefly gave Italy hope when he made it 2-1 after 36 minutes. France could have scored more with midfielder N'Golo Kante hitting the post and Florian Thauvin seeing his late volley brilliantly saved. "It really could have been a heavier defeat," France coach Didier Deschamps said. "We have the ability to play fast and create chances. If we could finish better then we'd feel more comfortable during games." Umtiti tapped home from close range after eight minutes at the Allianz Riviera stadium in the southern city of Nice, scoring when Mbappe's volley from right back Benjamin Pavard's cross hit goalkeeper Salvatore Sirigu's leg and fell kindly to him. France's 22-year-old fullbacks both impressed, but especially left back Lucas Hernandez with his surging runs. In the 29th minute, he ignored Griezmann's call to pass and carried on sprinting into the penalty area, where he was upended. Griezmann was probably glad Hernandez didn't listen. From the resulting penalty, Griezmann coolly slotted home from a short run-up to bag his 20th international goal. The penalty was confirmed after the Video Assistant Referee was consulted. VAR was used again moments later, but this time Italy striker Mario Balotelli was not awarded a penalty after being fouled. However, Balotelli struck the ensuing free kick hard and goalkeeper Hugo Lloris fumbled the ball straight into the path of Bonucci. Balotelli, recently recalled by new coach Roberto Mancini after a four-year absence, looked sharp and went close straight after halftime when Lloris kicked away his low shot. In a classy gesture, sections of the home crowd chanted 'Super Mario' — the song Nice fans have reserved for Balotelli in the past two seasons. He scored 33 goals in 51 league games for Nice, but his contract is up and he is expected to leave. France was most dangerous using the searing pace of its forwards on the break. Dembele went close after cutting inside two defenders and curling a shot against the crossbar. Midway through the second half, the Barcelona winger netted with a superb curling effort from the edge of the penalty area. France hosts the United States next weekend before flying to Russia, where it opens its World Cup campaign against Australia on June 16. Les Bleus take on Peru five days later and Denmark on June 26.